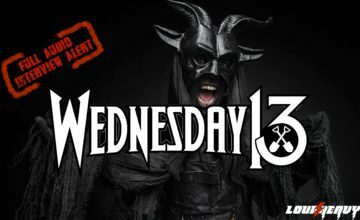 Wednesday 13, who mixes punk rock and metal with kitschy horror imagery and who is formerly one-half of The Murderdolls braintrust, is back on the scene and there is lots of activity taking place in his blood-spattered world. Wednesday 13 will embark on a tour this fall, traversing the U.S. in September and October. 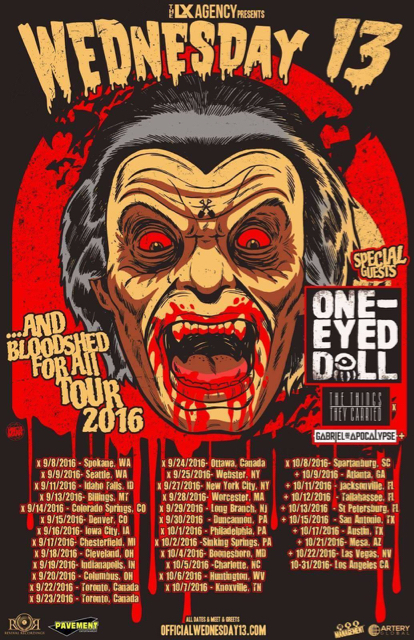 One-Eyed Doll will serve as direct support for the entire tour. The Things They Carried will appear from September 8 through October 8, while Gabriel and the Apocalypse will join the tour October 9 through October 22. Wednesday 13 will perform two shows in London at the Garage on October 28 and 29 to celebrate the 10-year anniversary for his 2006 album Fang Bang. There is also a special show on Halloween Night at the world-famous Whiskey A Go Go with Michale Graves. In addition to this heavy duty touring schedule, Wednesday 13 will enter the studio in August with producer Chris “Zeuss” Harris to work on the seventh Wednesday 13 album Condolences, which is the follow-up to 2015’s Monsters of the Universe. Zuess has also worked with Wednesday 13 and guitarist Roman on the 2010 Murderdolls album, Women & Children Last. Condolences is slated for an April 2017 release. Wednesday 13 will release a live DVD later this year titled Almost Dead: LIVE. 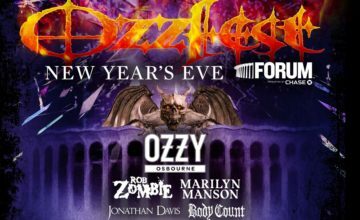 The release will feature live, acoustic, and backstage footage from the past few years’ worth of touring in the U.K. and from the Monsters of The Universe Tours in Europe.